Among the luxury home communities with views in Las Vegas, NV, MacDonald Highlands offers the most remarkable custom lots’ locations. “Outstanding views from MacDonald Highlands are one of the many reasons for buying within our development,” said Rich MacDonald, president of MacDonald Companies. 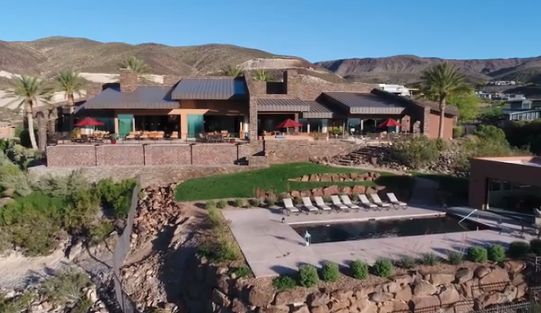 The clubhouse of DragonRidge is an impressive, 35,000 square-foot stone and glass building featuring a gourmet dining room, two mixed grills and lounges, a fitness facility, a swimming pool and golf pro shop. With the recent addition of the DragonRidge Tennis and Athletic Center, residents at MacDonald Highlands will find all the amenities that any luxury real estate communities in Las Vegas, NV has to offer. Different packages are available including golf, sport, corporate and social membership for residents and nonresidents of MacDonald Highlands. MacDonald Highlands offers custom home sites at the neighborhood, Dragon Gate. These home sites feature magnificent views of the Las Vegas Strip, the golf course and surrounding mountain range. Luxury homes on McCullough Mountainswithin MacDonald Highlands start at $1.4 million and offer hillside or golf locations. Located just minutes from the Las Vegas Strip and McCarran International Airport, the lushly landscaped entrance at the intersection of Valle Verde and Horizon Ridge welcomes owners and guests to living at the top, MacDonald Highlands.